If you don’t have an instructor available to help you on the spot, I can offer you remote guidance with Equestrain Image coaching. Equestrain Image coaching is coaching using video. Using video makes it possible to assist you from a distance. During a phone call using Skype, we will do a detailed analysis of the video together. In this process, I can help you discover how to develop your horse and yourself as a trainer. I will help you find a strategy to take your training to the next level. It doesn’t matter where you live. All you need is a camera and access to internet for Youtube and Skype. How can Equestrain Image coaching help you? If you are in doubt and you would like me to help you, please just contact me and tell me about your training challenge. Make a video of your training session. Put your video (unlisted) on Youtube. Send me your questions about your challenges (together with the link to the Youtube video). I will make an analysis and prepare some pieces of the video for us to analyse and discuss together. Make an appointment for our Skype conversation. When you buy a Imagecoaching Voucher, I will send you more detailed information. For €39,= per session you’ll get detailed feedback on how to progress from here. Before the session I’ll analyze your video. The interactive session will take between 30 and 45 minutes. Payments through PAYPAL, please send me an email, so I can send you a payment request and the voucher with further instructions. (Please include your email adress so I can send you the voucher with further instructions). 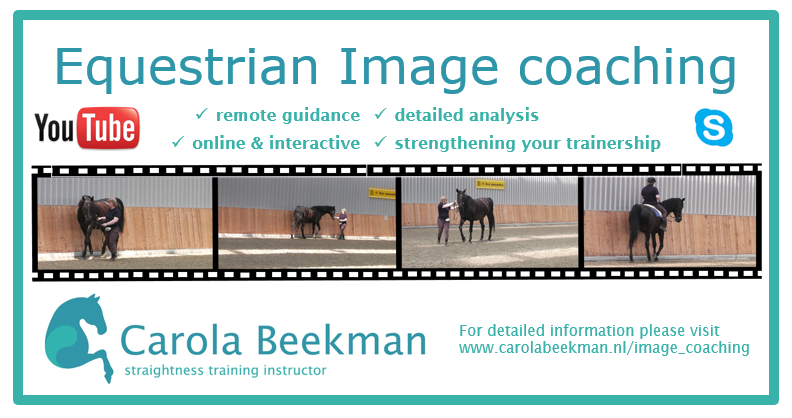 Carola Beekman is a certified Image Coach and instructor in Straightness Training.